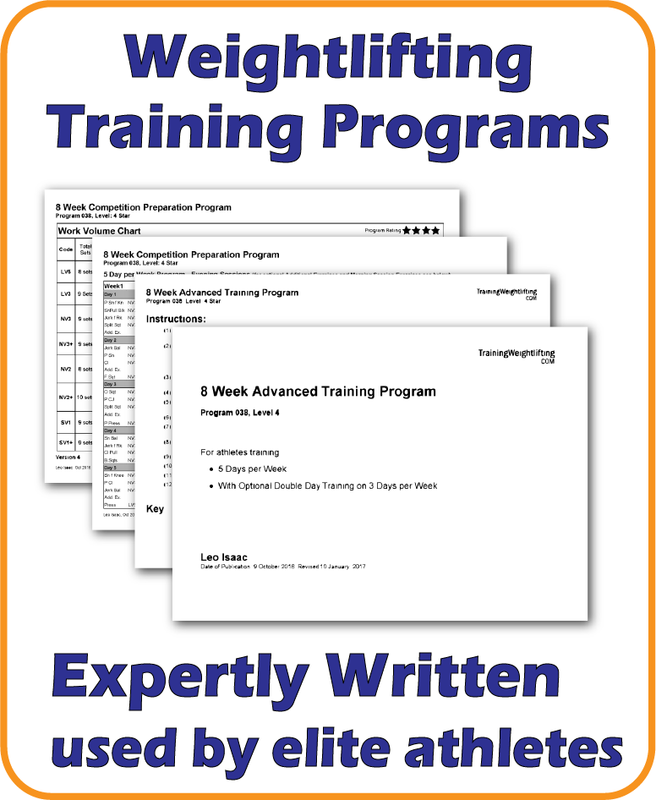 Training frequency in Weightlifting: When to add another training session? The simple answer is of course that it depends on the 'circumstances of the individual athlete' but an answer of this nature does not really help. What's really needed is a number of criteria that the athlete and the coach can consider to determine whether circumstances permit an additional training day. To my athletes, I would like to take a moment of your time to explain how I might see things differently about training, your training. Last night was a designated 'heavy' session. I know that you very much look forward to such sessions in the hope that you can push beyond your present personal bests. Last night, many of you were rewarded for your efforts. Well done! It is accepted theory in Weightlifting that genetics plays a substantial role in the ultimate performance of the individual (12, 33). A typical belief is that Weightlifters of the highest performance levels have a greater ratio of fast-twitch to slow-twitch fibres (29). Similarly, a common opinion in the Weightlifting community is that certain anthropometric characteristics strongly influence success such as shoulder circumference (38) and shorter height and limb lengths (34). Furthermore, many researchers have found that Weightlifters as a group are amongst the most mesomorphic of all athletes (25). However, environmental factors also play a highly significant role in success in Weightlifting. These factors include the coach’s leadership skills (8), the coach’s knowledge and effectiveness (7), the culture within the training environment (22) and the degree to which the athlete develops a sense of belonging or relatedness to their sport and their training colleagues (30). These factors will affect the motivation of the athlete to pursue training over the many years of deliberate practise (10) at increasingly higher levels of commitment needed to attain high performance. Furthermore, environmental factors will impact on the athlete’s ability to cope with the psychological pressures of extreme heaviness in critical moments in competition and training. For these reasons, success in Weightlifting should not be considered as predominantly dependent on genetics as is a popular view, but instead on a relatively equal contribution of genetics and environment as portrayed in Figure 1 above. There are currently 44 in-depth articles current available on this website for coaches and athletes in the sport of Olympic Weightlifting. More articles are written on a weekly basis. The following table provides a listing of free and subscription required articles (SUBS). A subscription may (a) One Month or (b) Full Membership.